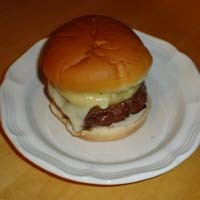 This is one of my favorite quick and easy burger recipes. The beautiful thing about these is the fragrance, the presentation, and of course the delicious taste. And no, you do not need to wait for summer to make these. In fact, in a some what cruel and unusual punishment sort of way, I find that the best time to make these is in the middle of January late at night. This way the thermal layers are just right so that the BBQ teriyaki smell gets trapped and the decadent fragrance permeates the entire neighborhood. Talk about messing with the neighbor’s stomachs at 9:00 PM when they are trying to go to bed. Years upon years ago, I did this for the first time after a late night at work not fully realizing the time. In hind-sight I must have gotten home just after midnight and fired up the grill around 1:00 AM. By 1:30 AM as I was eating in the quite darkness of the back yard, I noticed kitchen lights flick on in nearly every house in the neighborhood. Poor things, they were up scouring around their kitchens like little errant mice trying to find something to eat, something to curb their sudden deep thirst for BBQ, without any real knowledge to why they were suddenly so hungry. Yeah I know it is mean. But there is something about a nice hot teriyaki burger in the late evening. Now before you get started a few rules of the game. If you can see through your teriyaki sauce, it is not a sauce but flavored water. If it is not as thick as honey, then it is just flavored water. Now I realize that everyone’s tastes are different, so go hunting for a teriyaki sauce that you like. Try it as a dipping sauce with some chicken or Chinese take out first. If it is good, then use it else where in your cooking. Cooking is 30% raw materials, 40% recipe, and 30% technique. If you do not have good raw ingredients, it will not taste good. Now one of the readily available commercial sauces I like is the Kikkoman, Terriyaki Sauce from their Takumi Collection. It has a purplish label and is pretty good, though not wonderful. - Knead hamburger, Teriyaki sauce, Lawry’s seasoned salt, black pepper, and garlic together and form in to two patties. - Barbeque your burgers to your normal desired internal temperature, though I would suggest a nice “medium” that is hot throughout but with a nice slightly pink middle. - Right before the burgers are done, place a pineapple ring on top of each burger and fill the center of ring with an additional 15 ml of Teriyaki sauce. - Place the Kaiser rolls or hamburger buns on the grill for a few seconds to toast and then serve.